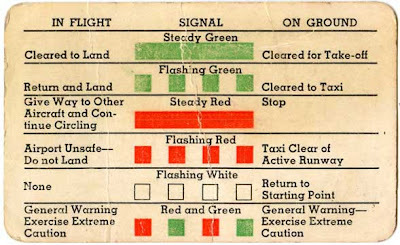 Part of my cabinet cleanup unearthed this credit-card sized, pilot's pocket reference for landing signals. My grandfather flew Cessnas for Arkla Pipeline and Gas from the 40's through the 60's and this was among his things. My grandmother once told me that grandpa would fly over their house to let her know he'd be at the local airstrip soon to be picked up. She'd step out in the yard hearing a plane approach, and he'd 'toggle the wings' to let her know it was him.